When University of Washington Professor Benjamin Bradshaw discovers the dead body of a despised colleague inside the Faraday cage of the electric machine, his carefully controlled world shatters. The facts don't add up. The police shout murder—and Bradshaw is the lone suspect. To protect his young son and clear his name, he must find the killer. Seattle in 1901 is a bustling blend of frontier attitude and cosmopolitan swagger. The Snoqualmie Falls Power Plant lights the city, but to most Seattleites, electricity is newfangled and dangerous. The public wants a culprit—they want Bradshaw behind bars. The killer wants Bradshaw dead. His life and liberty threatened, Bradshaw discovers the thrill of investigation as he's thrust deeper into the hunt. But questions abound. How had the electric machine's Tesla coil delivered a fatal shock? Was the murder personal, or was it connected to President McKinley's planned visit? Were students involved, or were they in danger? And why had Bradshaw's best friend, Henry, fled to Alaska on the day of the murder? Danger and death lurk everywhere—disguised as accidents. Then Henry’s niece, Missouri, appears on Bradshaw’s porch in need of a home. Her unorthodox views and femininity confuse and intrigue him, and he feels a spark of love while yet struggling to protect his own haunting secret. Has Bradshaw begun to feel alive again only to lose all he holds dear? Before it’s too late, he must discover the circuit path that led to a spark of death. 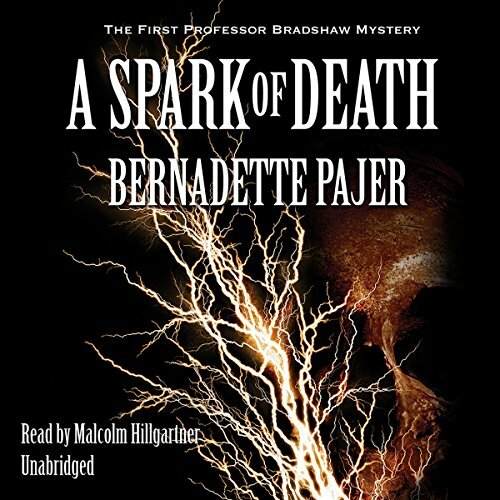 ©2011 Bernadette Pajer (P)2011 Blackstone Audio, Inc.
With Seattle history and early electricity science subtlety woven into the storyline, this new mystery guides the reader through a murderous event that changes Professor Bradshaw's life. Expertly read, the actor gives the professor a voice that enhances his character. I am anxiously looking forward to the next book in this new series. FANTASTIC! I ENJOYED MYSELF SO MUCH! I am so glad I found this author. Bernadette Pajer is an excellent writer. The plot was good and the story flows smoothly right to the end. It is difficult to find a good writer and I have in Audible that so far there are only four books published. I do hope there will more in this series. The narrator, Malcolm Hillgartner is excellent. His voice for Professor Bradshaw is wonderful... He sound such a gentleman, kind and understanding. The plot was very good I could not guess who the killer was until the end. Well worth a credit.